only season I played in EU he was my scout, awesome. I haven't cast for 2 years? One of the best hour long mindless pub maps I've ever played, they even had a night version lol. I could get even non-tf2 lovers to pub on that map it was so truly fun. I wonder if it's still on servers, it was so popular they had 24/7 servers for a while. Your drawing is so spot on it's scary, even down the pillars in the green area. Would you believe there was a 12 minute medic frag video made 9 years ago? I was thinking about this today and has there ever been anything else made like this, I'm not talking one player with a few sick arrows and surfs but like a proper edited compilation of top medics. I know we all had to bribe davis to edit/create this before but what would it take now for someone to put in this effort again lol, the skill ceiling is SO much higher now too there would some amazing plays. 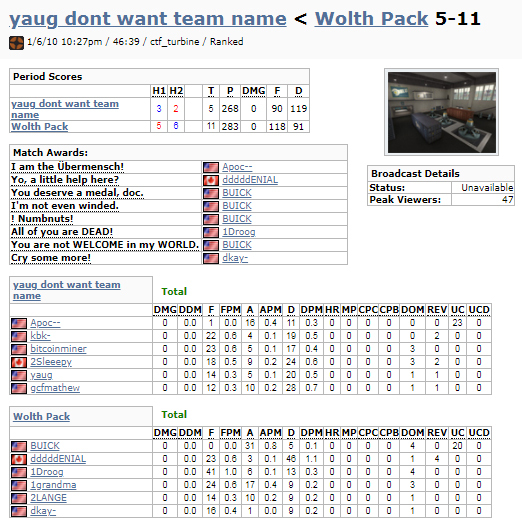 It's kinda cool looking at kill feeds from ages ago though, man has stuff changed. double comment but idc, I want to bottle up the casters pure energy and love for what's going on and save it for later. god you don't know HOW BAD I want to see sven some back.